Develop a research strategy for locating information on your topic. Find answers to specific questions. Locate books and other library material using WorldCat Discovery, the library’s online catalog. Use the library’s print and electronic resources. Select and evaluate authoritative information sources. Find “quick” reference resources, including, style guides, English and foreign language dictionaries, thesauruses, and current atlases. Understand library services and policies. Individualized appointments are available to assist students with assignments, research papers, and senior projects. Please visit the Reference Desk to discuss your research or to request an appointment. 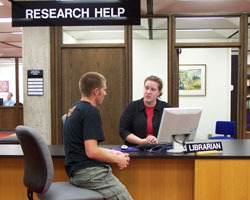 Please contact the Research Help Desk or your Library Liaison to discuss your research project.